The Princess Royal Training Awards is a prestigious new awards programme for 2016, designed by the City & Guilds Group and supported by their president, HRH Princess Anne. It is the one award that gives organisations of all sizes and from all sectors within the UK, recognition for successfully linking skills development needs to business performance. It provides a unique opportunity for employers to be publicly recognised for their approach to learning and development and its impact on their business. 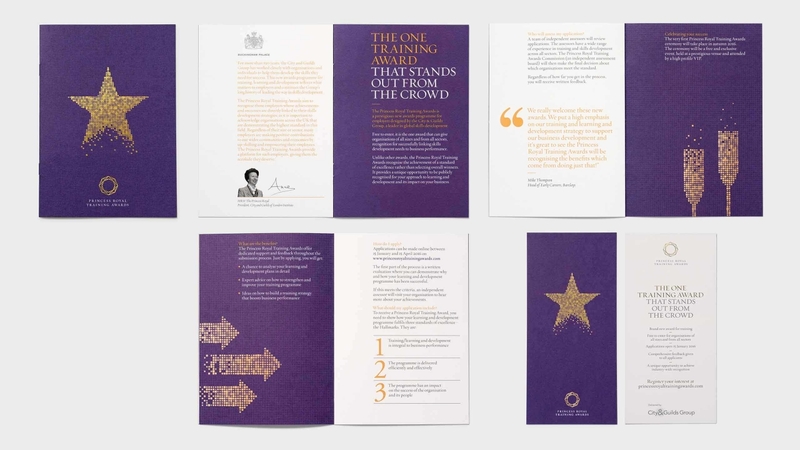 Unlike other awards, the Princess Royal Training Awards recognise the achievement of a standard of excellence rather than selecting overall winners. Purpose has been working with the City & Guilds Group to create the full identity and roll-out for the new awards programme. This includes a range of direct mail, suite of stationery, guidelines, website, an animated logo, supporting infographics and leaflets for their various audiences to raise awareness of the programme. Since the call for entries back in January, the Princess Royal Training Awards have been overwhelmed with submissions, receiving 110 applications in the first year – an 83% increase over the original target. The successful organisations will be announced in August and celebrated at the award ceremony later in the autumn. For more information about the Princess Royal Training Awards, please click here.